Clean and understated in design, this diverse low-profile bed adds a sleek sleeping centerpiece to any bedroom in your home. This bed features a raised base on slim block legs, a slightly sleigh styled headboard with a slat cutout, and a low profile footboard, all completed in a rich brown finish. This low-profile bed is a smart and minimalistic design choice for any bedroom in your home. 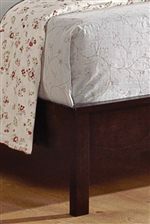 Available in Twin, Full, Queen, King, and California King sizes, this bed can be placed in youth or adult bedrooms of any size, to meet your design and style needs in your home. The Ian Full Low-Profile Bed with Cutout Headboard by Crown Mark at SuperStore in the Williston, Burlington, VT area. Product availability may vary. Contact us for the most current availability on this product. 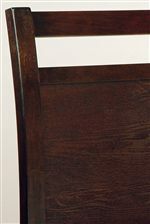 B7300-F-RAIL Full Rail 1 0" 0" 0"
B7300-F-HBFB Full Headboard & Footboard with Slats 1 0" 0" 0"
Finish & Paint Options Rich dark brown finish. Handles & Hardware Silver burnished bar pull hardware. Case Detail Sleek and clean traditional lines with slim block legs and raised bases. Understated and sleek transitional styling can be found in the rich and functional Ian collection. This group features clean and straight geometric lines with a smart, deep brown finish, silver burnished bar pull hardware, and raised bases on slim block feet. The Ian collection is both functional and fashionable, while being unobtrusive and minimalist, adding great fashion without overpowering a room. Make a smart and timeless design choice for the bedroom in your home today, with the Ian collection. The Ian collection is a great option if you are looking for Transitional furniture in the Williston, Burlington, VT area. Browse other items in the Ian collection from SuperStore in the Williston, Burlington, VT area.